← Banned Books Week 2018: “Banning Books Silences Stories. Speak Out!! Updated photo of Barton Art League display relating to Censorship and Banned Books. Update: A few more pieces have been added to the student art exhibit since this post was first published. Drop by when you can to see them all! The Barton Art League describes itself as “made up of Barton students who have a genuine passion for art and all the creative fields. We are not limited to visual arts.” One of the BAL‘s goals is to display as much student art on campus as possible, not only in Hackney Library but all over campus. Any student is welcome to join BAL, not just art students. If you are interested in participating, contact Nicola Macdonald at nlmacdonald@bulldogs.barton.edu; they are looking to become more active and welcome all newcomers. 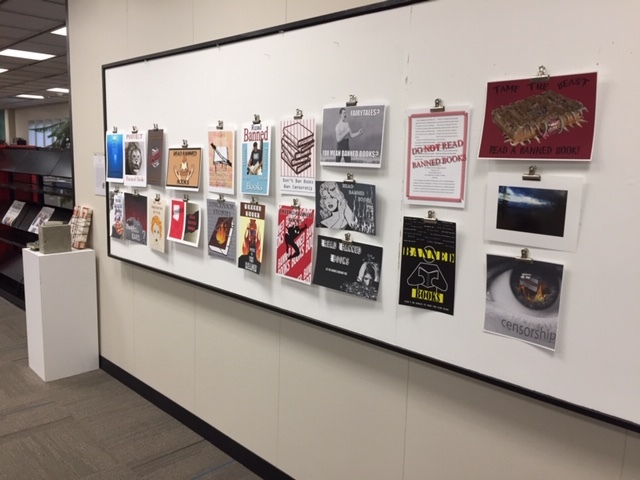 Come take a look at the BAL’s Student Art Exhibition, and see how your fellow students’ art reflects the theme of anti-censorship represented by Banned Books Week.